If you can defeat Myracyrina on Planet Necryptos, the Safiria will grant you the gift of immortality! Become a true vampire and get access to a unique vampire class and a exclusive mecha model for vampires only! Sekali Desert Zone Release:The vampire queen, Nephyrisi rules the desert sands of Sekali on Planet Necryptos. You will need to search the desert for her temple. A caravan of mysterious traders will provide you with some new vampire hunting weapons that will help you in your journey! You will have to find the map, staff and headpiece in order to unlock the secrets of Nephyrisis's Temple! Morrowood Zone Release: Mina needs your help! She has been bitten by a powerful vampire lord in the Morrowood Forest! Can you save her from becoming a vampire herself by severing the Necryptos Vampire Bloodline before it's too late? Your adventure starts in the Morrowood forest, where the Vampire Lord, Dimitri rests. War Update: Allied forces were defeated by the Shadowscythe in Westion space. What will happen when the Dragonoids clash? Are the citizens of Westion doomed to be assimialted by the Shadowscythe Empire? Find out in the The Epic Grand Finale cutscene! 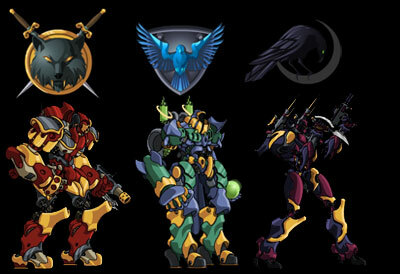 New Mecha Models Released! Corrupted Power Armor and Shadowscythe Behemoth mechas are now available at the Westion War Valor Shops! Our newest Star Captain Monthly mecha is also here! Get the Trash-talking, Shadowscythe stomping BC Warrior Class mecha NOW! The Shadowscythe have launched a full-scale invasion Planet Westion! Go to Planet Westion NOW! The Allied forces have set up headquarters in the Khaeldron Inn! Sys-Zero is leading the allied defense forcses on the ground! Star Captains will report to Queenadent Pureheart at the the Westion Space Station for special Starship missions! The fate of the galaxy rest in your hands! War Update: Dark times have fallen upon the galaxy...The Shadowscythe have won the war and have begun sending occupation forces to Planet Westion. In the meantime, the two Dragonoids are clashing in Westion space, creating an incredibly dangerous situation for all ships in orbit. Sys-Zero is leading an evacuation effort on the planet's surface now! A new cutscene has unlocked! Also, Level 40 Runehawk and Wolfblade mecha models have been rebalanced! The Assault Mecha Arcade Machine has just been updated with more options, better rewards and Facebook trash-talking! Play Assault Mecha at the Star Captain's Club in Soluna City or on the Intro Dropship! Also, in Planet Westion News: The Bronco Saloon in Alamonia is now open for business! So stop by and play a friendly game of cards with some unfriendly patrons! The most explosive chapter ever in the history of MechQuest continues! The Shadowscythe have been setting explosives all around Planet Westion. Sheriff Grif'th wants you to find them and defuse them before the entire area is destroyed! Your search for bombs will eventually lead you deep into the mines where a terrible trap awaits you! Learn more about Lord Valoth's horrible plan and the prophecy of doom that foretells the end of Westion! It's time to return to the Wild West(ion) for the most explosive chapter ever in the history of MechQuest! The Shadowscythe have found a way to invade Westion ... and the terrible Lord Valoth himself is overseeing the invasion. Mysterious portents in the skies and ominous happenings in the frontier lands outside Khaeldron - Sheriff Grif'th needs YOUR help! Today the Ghost hunting mecha was overhauled with some new specials. It is no longer only useful for ghosts! It has new specials like ESP and tStar Captain Spectral Armor! Also, there are 2 new versions at levels 13 and 18, The Spirit hunter and Geist Hunter! The level 13 and 18 version also come head and body buffs. A delivery for Firemane gets rudely interrupted! Firemane would like you to help her with a delivery to Vul'khar Ridge. Something's not right. the route that you are travelling is the same route that Ambassadors Garrokh and Stallione were traveling when they when missing. Perhaps you will finally know the answer. Go to Alamonia's townhall now to start this epic journey! Hunt down the elusive criminal know as Firemane! Roy Silver, the mayor of Alamonia wants you to help him apprehend an elusive criminal known as Firemane! You must impress the Vul'Kharim warriors of Vul'Khar Ridge and brave the shifting Sandsea to find her! Also, Queenadent Pureheart has a very important Star Captain mission. Go to the White Castle now for the biggest fight of your career! Train your mecha piloting skills! Read about it in the Design Notes. Customize your character with new stats! Stats include Power, Accuracy, Efficiency, Reflexes, Perception and Luck! To train your skills, goto GEARS University and take mecha piloting 101 Now! We have a brand new 20K nova gem package available now! You will probably never run out of nova gems ever again! This is hands down the best deal this side of that Solar System! Go to our secure upgrade page now to upgrade your character with Nova Gems. Read about it in the Design Notes. New Release LIVE! Introducing J6! Think you have what it takes to challenge this guy to duel? Oh, BTW, he is the sharpest eye and the quickest hand in the entire galaxy... Go to the townhall in Alamonia on Planet Westion NOW to find out! This quest features an insane armored uniform and our first weapon capable of a basic combo attack called the Arm of Zeus! The war at the mines of Khaeldron is over! The EvilCorp invaders have been scared off for the time being, but still have an agenda to fulfill! Unfortunately, the Vul'Kharim prophecy has been fulfilled and Westion is now on the Shadowscythe list for Galactic conquest! The war is still accessible in the town of Khaeldron for the next couple of days while we convert certain parts of it into permanent game content. The awesome new Drakel War Armor and rare war actionfigures is also available there! Calling all players! Unite against EvilCorp now to unlock the ultimate in new Drakel technology! Grab your friends and some popcorn and start taking down EvilCorp mecha now! The end of the war is near! I can smell it already! Oh wait... that's butter I'm smelling... Anyway, The Drakel Power Armor has awesome new specials previously unseen in MechQuest and it's color customizable too! ! Read the Design Notes for more details! Extra Mecha and Inventory slots now available! 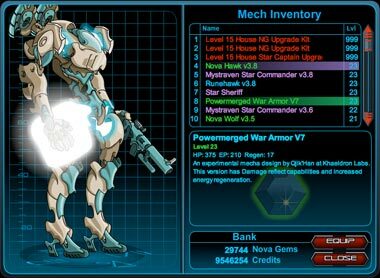 You may now purchase additional mecha and inventoryslots for 200 nova gems per slot. Talk to Admina in Soluna City to get more slots! New Star Captain Head weapons! 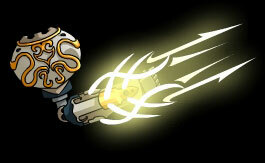 Awesome new lower level head weapons are now available for Star Captains. The facebeam model heads are available for levels 1, 3, 7 and 10 and may be found in the special shops at Soluna City as well as the newbie Shuttle shops. Rebels on the Moon Unite! New top secret prototype weapons are available now at the special shop in Soluna(level 6) and at the moon base (levels 13 and 18)! These weapons are unlike any other previously in the game. They have ammo instead of cooldown! When you're out of ammo, you will need to re-equip them! You have given the rebels a run for their money at the moon! Now, get ready to challenge their leader in a final bid for power! Beware, everything may not be as it seems. A VERY important decision awaits you character. Will you finally crush the rebels once and for all, or will you get stomped? Your Starships may now fly off-planet. If you are level 10 or higher, goto GEARS University and talk to Dean Warlic. He will tell you how get off the ground! A new high powered cannon is available at the moon base. This new cannon has a special move that takes a ton of energy and utterly hammerrs your enemy with a massive surge of power! This cannon is available at the Moon base. Not: if you have already found the black box, you will have to find it once again in order to open the shops. Star Captains, get ready to lift off! ...um, Houston? We have a problem! Someone sabotaged the starship currently docked at the spaceport in Soluna City. You must find usable replacement parts to restore working it to working condition! You will need to use this starship later for a high priority mission from the Kingadent himself. Talk to Dean Warlic in GEARS University to start the missions. The untainted version of Sys-Zero's Symbolic Blade is now in the Special Nova Gem shop in Soluna City! It has a special DoT (Damage over time) move called the Purifying Strike. Our latest animated short, J6's awesome, D.F.A. (Death From Above) is finally out! It's a little late because we ran into some issues embedding it into the game. 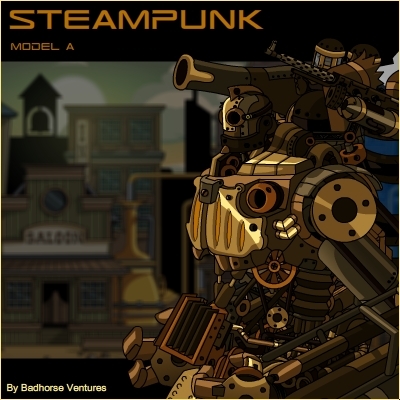 To watch the video, goto Cinemech in Soluna City, or click on Ballyhoo in the Intro Starship. Due to the lateness of this release, we are leaving the Holiday quest up through tomorrow. Top Secret Mission Part 2! Part 2 of the Rescue Sys-Zero quest has been released. this quest features another amazing cutscene from J6 and Warlic. Find out what really happened to Sys-Zero! Also, is the Shadowscythe war really over... or has it just begun? New Shadowscythe Mecha Available now! Soluna City engineers have managed to rebuild an awesome Shadowscythe mecha from salvaged parts! 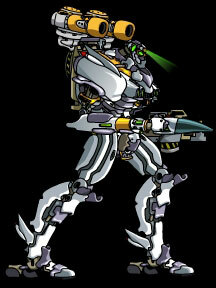 This new mecha is available in the special Nova Gem shop in Downtown Soluna City! Released today, Star Captain and Nova Gem versions of the three house mecha now have the ability to be upgraded to new, higher level (20) versions. They are stronger, more powerful, what's not to love? There are three new items in the special Nova Gem Shop in Soluna City today. Check out the Inker, the Jelly Blaster and the eldritch Call of Kathool-Atchoo! Powerful new Dino-Mecha are available now! There are two playable models, the Tyrant, available at the Museum Repli-Mecha shop and the Veloci-Mecha, available at the special Nova Gem Shop in Soluna City. There's a new minigame at the Soluna City Museum. The Underwater temple is now open, along with a brand new unlockable fossilzed skeleton. Dive into the depths dodging deadly jellyfish and battleing ancient creature of legend! Why are the Shadowscythe so interested in these ruins anyway? GEARS House Mecha Models are Here! Update! Enemy cooldowns now work properly in PvP and Enemy fights! Update: The Hospital Rescue Minigame is finished! Talk to Nurse Helia at the Soluna City Hospital if you want to help out with the rescue attempt. The ShadowScythe suffered their first defeat at the hands of you and your fellow GEARS University students. The attack may be over, but many of our friends are still trapped in the war zone. Nurse Helia is organizing a rescue mission... and it looks like you get to pilot one of the hospital's Wyvern Striker helicopters! This release is scheduled for Wednesday.... but since we are giving ourselves less than 24 hours to make it, maybe Thursday... Friday at latest. Worse case, Saturday... maybe Sunday. But we are really aiming for Wednesday night EST (Wish us luck). Head to the university and test put your mecha to the test! Featuring a brand new enemy mecha model, new background artwork, and some... stick figures.... this is our first true challenge zone in MechQuest. See how far you can go! If you need more fire power, complete missions found in Soluna city shops and gear up with mecha and weapons from Tek's shop or the holiday seasonal store. Good luck getting your A! and now we are going Ghost Hunting? This has to be one of the most insane mecha games ever made! A brand new shop has opened featuring one of the strangest characters we have ever created. We even added a few voice clips for this one. 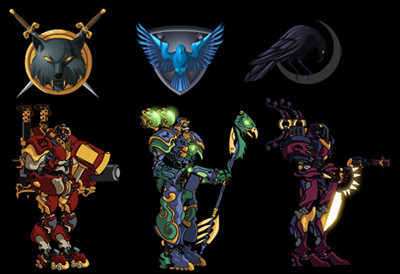 MechQuest is officially the first flash based Mecha RPG game that can predict...YOUR FUTURE! Go on spook busting quests and earn a new mech, and perhaps enterance to the most mysterious club in the known universe. Tip: Expert ghost hunters will first obtain the best "ghost trap" they can from Mysterious Johnson's mecha store. The entry level trap costs 0 credits, but you really get what you are paying for! So be sure to earn a few credits and get yourself a top of the line model. To catch a ghost that is haunting a mech, first... begin combat! Go all out damage until the enemy falls below 30% and starts glowing red. That is you cue, use your "ghost trap arm"! You may have to use it a few times to catch the ghost. If you catch it you will zap the ghost right out of the mech and into your trap. That is all there is too it -- Good luck spook busting! Undercover Mission & Boss fight released! The SPD (Soluna Police Department) is now open and features new quests, monsters, uniforms, hats, equipment and mecha. 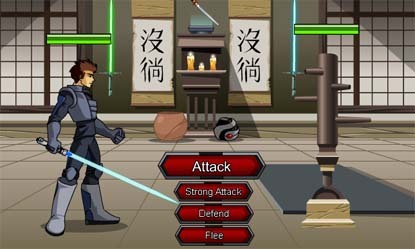 Put your combat skills, energy sword dueling and sleuthing skills to the test! Find all of the clues and use your detectives notepad to go on brand new special quests including an undercover mission to infiltrate the enemy base. Battle MechQuest's first boss... well, actually... make that three bosses! (Defeating them all will unlock a brand new and VERY COOL new mecha model at the SPD Impound)! 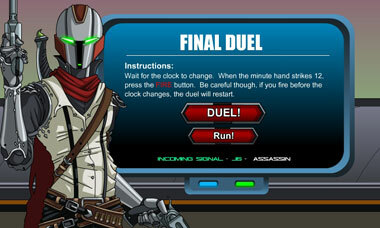 Artix: "To join the force you must use the force!" Zhoom: "What is the Force?" Artix: "Cysero, do you want to take this one?" Cysero: "The Force is what gives a Jedi his power. It's an energy field created by all living things. It surrounds us, penetrates us, and binds the galaxy together." Zhoom: <in serious voice> "So, is that going to be a quest drop?" "Werewolves? HAH! Myths... Legends.... Fairy tales. They do not exist. Never have. Even if they were real they would never go cruising around on motorcycles stealing random stuff for no reason at all. ", said hover bike repairman Wulf Lupanelli during last weeks holovision interview. "Before you can truly master the art of mecha combat, you must first become a master of yourself. You will not always be safe within the protective armor of your mecha. 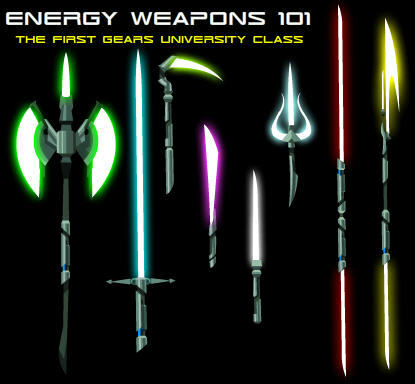 This is why the first available class at Gears University is Energy Blades 101! My good friend, Master Tsuba teaches this class. He is the foremost expert in energy weaponry in the galaxy and we are honored to have him as a faculty member this year. Energy Blades are very powerful weapons that draw from your inner power (which is a battery concealed within your uniform.)" Shaves as close as a Laser Blaster or your credits back! Level Cap Raised to 15! Many of you have already reached level 12. Today, we raised the level cap to 15. Now we can start making some harder enemies! Battleon! Sys Zero says, "Flight attendants, please make final preperations. We are preparing for our final descent, landing in Soluna City, home of GEARS University. Estimated time of arrival is 12:00pm EST. Also we just received this message from Dean Warlic. "All pilot candidates (This is you) upon landing are to check in with Admina the enrollment officer. She will be hard to miss with that giant yellow ! above her head." Good luck on your exam! Due to a severe malfuction in the exam assessment drone an unusually low number of pilot candidates are making it into GEARS University*. There have not been any complaints though**. The friendly faculty at GEARS University anxiously awaits the arrival of new candidates to try the entry exam.... including you. Who we are SURE will score far better. ** Nor have there been any survivors... we are certain this is just a coincidence. or oh well, there's big shiny mecha! 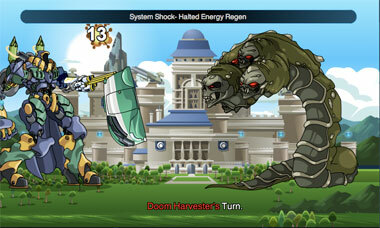 5,000 years before AdventureQuest* there was a time of BIG AND HEAVILY ARMED MECHA! Hundreds of tons of lasers, missiles, cannons, machine guns, flash lights and the toaster of destruction.... the holes these weapons make will be so big you will probably completely miss the plot holes! Build, customize and pilot your own Mecha in what will be best described at "non-stop-insane-chaotic-explosions". Battle on! *or 4,995 years before DragonFable. As MechQuest begins on the world of Lore the year is 3007. From this moment on, all posts will be made in real time -- FROM THE FUTURE!